I haven't been blogging much lately - apologies to those who've checked the site and been disappointed - but my weekends have been pretty thoroughly taken up with Celtic / medieval things. First there was the Fair at Elizabeth - a very pleasant if somewhat warm weekend. I spent both days there with the Colorado Welsh Society, commuting from Denver, and did several storytelling sessions. These worked better the second day when we figured out the mike and sound system we'd brought with us - unamplified storytelling in competition with bagpipes is not recommended! The following weekend was taken up partly with a visit to the Colorado Renaissance Festival - only as customers this time, not performers - and partly with sewing (a new pair of trews) and packing for next week's trip, with a little gardening interspersed. (The tomatoes are producing very well, especially the assorted small varieties). Denver continues to have an unusually mild and wet summer - I haven't had to water the grass at all, which is almost unheard of - but the tomatoes seem to like it, not to mention the weeds. My next excursion is to another SCA event, which I'll tell you about when I get back. Let's just say it should involve a lot of bardic activity, and I hope some book mongering as well! And on the topic of books, I amused myself this afternoon adding a page for the next book in LibraryThing. You can see it here. Not much writing done yet, but my researches into 6th century Ireland proceed apace. 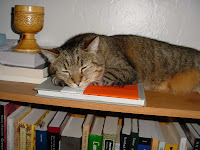 Oh - that's Falco in the picture guarding the library book.